Microsoft Excel has a lot of settings that assume you have a fiscal year that ends on December 31 with 12 months that correspond to calendar months. 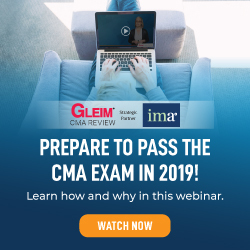 But what if your company uses an alternate calendar, such as a fiscal year ending in March, a 13-month calendar, or a 4-5-4 calendar popular in companies that measure retail sales? The new Data Model in Excel 2013 can help. Say that you have data for 2016 and 2017 based on the National Retail Federation 4-5-4 Calendar (http://bit.ly/2eCFaae). You need to create a calendar table that has one row for each date in your data set. Add a new worksheet with each day from January 1, 2016, through February 3, 2018, listed in column A. Add columns for year, season, quarter, month, week, day, and weekday. Use row 1 for the header cell for each column. Make sure there are no other heading cells other than those in row 1. Any time that you need to create a pivot table and report using the alternate calendar, you will copy this small worksheet into the workbook containing your sales data. 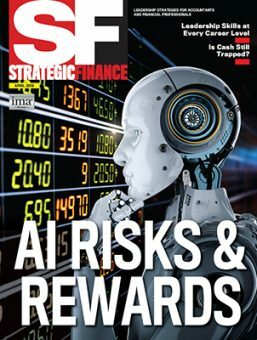 Now go to your transactional data set. Select Insert, Pivot Table. 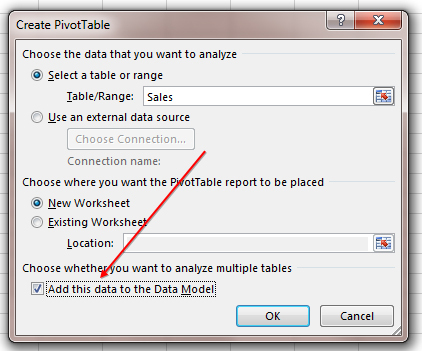 In the Create PivotTable dialog, choose the box for Add This Data to the Data Model. When the Pivot Table Field List appears, there will be a new choice at the top letting you select between Active or All. Change the setting to All, and the Calendar table will appear in the field list as well. Click the triangle icon next to each table to expand the list of fields for each table. 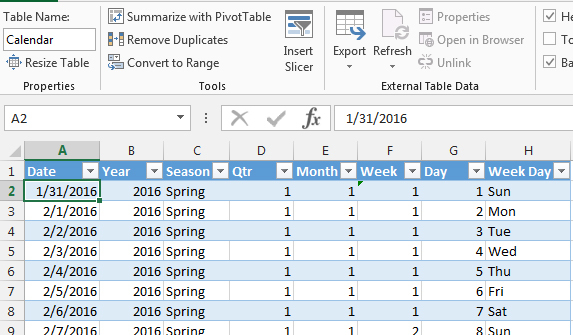 Build a pivot table using fields from the Calendar table in the rows or columns. 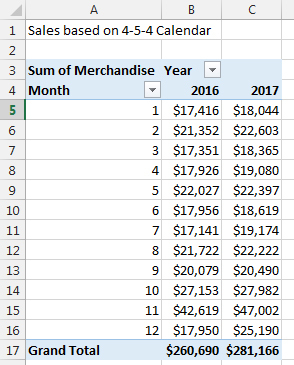 Place the Revenue field from the transaction table in the Values area. A yellow box will appear in the Pivot Table Field List showing that Relationships May Be Needed. In Excel 2013, the only choice is Create. 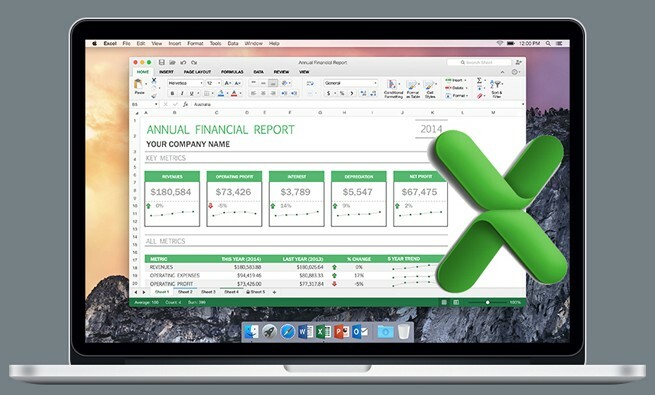 In Excel 2016, you can choose to Auto-Detect the relationship. When you choose Create, you have to specify that the Date field from the Sales table is related to the Date field from the Calendar table. 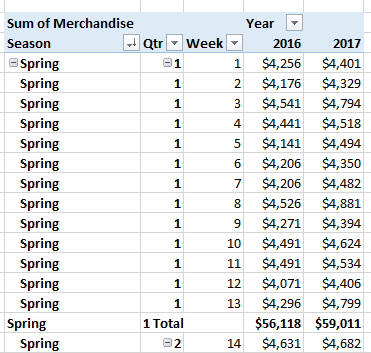 Once you’ve established the relationship, you can build any pivot table using the year, season, quarter, month, week, or weekday fields from the Calendar table. While the fill handle is great at filling month names such as January, February, and March, it requires special handling for filling month-ending dates. For a regular calendar, type 1/31/2017 in a cell. Right-click the fill handle and drag. When you release the mouse button, a fly-out menu appears where you can choose Fill Months to make the month-ending dates appear. But there’s no equivalent tool for filling month-ending dates of a 4-5-4 calendar. Type a heading such as MonthEnd and add the month-ending dates to the column. In an adjacent column, use =TEXT(C2,“M/D/YYYY”) to convert the dates to text. Select your list of text dates and the MonthEnd heading. Go to File, Options, Advanced. Scroll most of the way through the list and choose Edit Custom Lists. Click Import to import your list. Click OK. 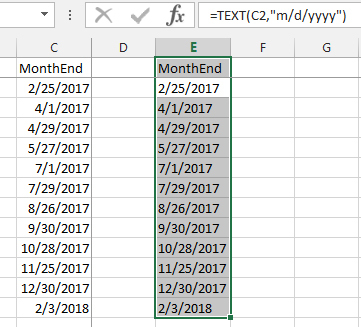 In the future, to fill the month-ending dates, type MonthEnd in any cell and drag the fill handle. The text dates will appear. While those dates are selected, type Alt+DEF <enter> to convert the text dates to real dates. I do not see Add this data to the data model under create pivot table. Is this an add in?